If you only add one new thing to your Thanksgiving menu this year, please let it be this Thanksgiving Stuffing. I’m sure you have your tried-and-true family favorite–but, trust me, there’s room on the table for this one, too. Each year I test out a new stuffing recipe just to see if there’s something out there that I’ve been missing. And usually the new recipe I make is delicious, but not so good that I wondered how I made it 34 years without ever eating it. This one, is that good. This Bon Appetit recipe originally called for sourdough bread but since I really, really hate sourdough I opted for a regular Italian loaf and it was perfection. If you happen to love sourdough, however, by all means go for that. The background players are the traditional butter (LOTS of butter), celery, onion… but there’s the new addition of fennel (or anise if you can’t find fennel) and white wine. These subtle hints really boost the flavor profile. Plus, you then have breakfast sausage (not Italian, which I usually use in my Thanksgiving stuffing) and all of the fresh herbs. This really is the kind of stuffing you could eat for breakfast, lunch, dinner and snacks. But then again, maybe I just have a problem? 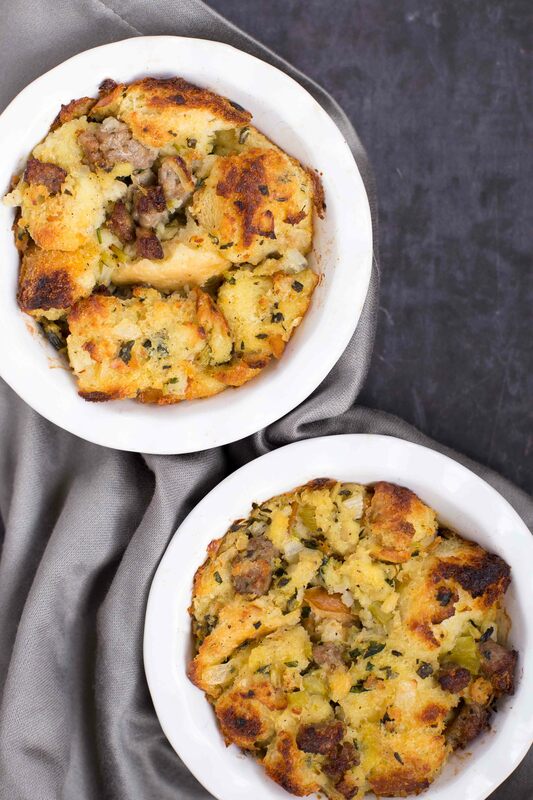 If you don’t like meat in your stuffing, I’m confident that this will still be out of this world without it (but really, try to use the sausage). Like so many recipes I use for big holidays, this one can be made ahead and baked the following day or even frozen (before baking) to minimize your last minute holiday prep. Also, be sure to check out this wonderful round-up of 30 Easy Thanksgiving Appetizer Ideas featured on Redbook. My easy Spinach Puffs recipe made the cut and they really are a delicious, easy make ahead appetizer for all of the upcoming holidays. Let the eating games begin! Preheat oven to 300°F. Divide the bread between two baking sheets and bake for 25-30 minutes on the middle and top racks, tossing occasionally, until it's dried out (you don't want it to brown more than just a little bit). Allow to cool. 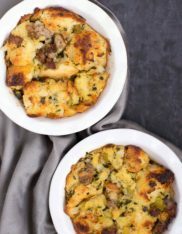 While the bread is baking, heat the olive oil over medium-high heat in a large skillet and arrange the sausage in a single layer and cook, undisturbed, until browned on the bottom for about 3 minutes. Break the sausage up into small pieces and continue to cook until it's cooked through - about 5 more minutes. Transfer sausage to a plate. Reduce the heat to medium and melt 1 cup butter in the same skillet. Add chopped onion, celery and fennel (or anise); season lightly with salt and pepper. Cook until the vegetables are translucent and tender, stirring frequently about 12-15 minutes. Add wine and scrape the bottom of the skillet to release any browned bits. Bring the wine to a boil and cook until the wine has evaporated - about 3 minutes. Add in the fresh herbs, toss to combine, and allow the mixture to cool in the pan. Whisk the eggs and 2 cups of chicken broth in a very large bowl. Add in the dried bread, sausage and onion mixture. Toss well to combine. Add 2 tsp salt and 1 tsp pepper. Slowly pour the remaining 2 cups of chicken broth over the bread. Let sit, stirring occasionally, until the bread absorbs all of the liquid. Transfer the stuffing to a buttered 9"x13" baking dish and butter a sheet of aluminum foil to cover the dish (butter side down). Bake on the middle rack covered for 35-40 minutes (it should be hot in the middle), then uncover and increase the oven temperature to 425°F. Continue to bake until the stuffing is golden brown, about 25-30 minutes longer. * If you're making this the day before, stop at Step 6 and just cover refrigerate until at least an hour before you're ready to bake - allow it to come to room temperature before baking. If you're making this ahead and freezing it, take it out of the freezer the day before and allow it to defrost and come to room temperature before baking. Recipe adapted from Bon Apppetit.